In his keynote address at the 2012 NEXT National Gathering, Stacy notes that the church faces an adaptive challenge in the wake of a cultural tsunami. He encourages us to re-imagine the gospel through a ministry of poetry, prayer and prophetic witness. Stacy Johnson is Arthur M. Adams Professor of Systematic Theology at Princeton Theological Seminary. In a sermon full of stories and memories, Lewis Galloway, proclaims that despite anxiety, the lightning speed of change, uncertainty of the church’s message, that hope never gives up. Lewis Galloway is the pastor of Second Presbyterian Church of Indianapolis and member of the NEXT Church Advisory Team. In this post-Constantinian, post-modern, post-denominational, post-Christian world, the structured connection the Presbyterian church has depended upon no longer serves us well. In this sermon Pen Peery suggests these uncertain times are similar to the uncertainty the disciples faced in the book of Acts. Our temptation is to control rather than to trust the guidance of the Spirit. Pen offers a vision of connectionalism based on trust, that does not speak in one voice but celebrates the chorus of witnesses that make up Christ’s body. Pen Peery is the pastor of First Presbyterian Church of Charlotte, NC and member of the NEXT Church Strategy Team. We live in a time of rapid change and no one has charted this territory before. However, our ancestors in the early followers of Jesus and in the Protestant Reformation also lived in times of tremendous change. In this astute testimony, Chris Chakoian lifts up three ways in which our forebears responded to change and suggests these three practices are our work today. John Wilkinson introduces her. Chris Chakoian is the pastor of First Presbyterian Church, Lake Forest, IL and member of the NEXT Church Advisory Team. John Wilkinson is pastor of Third Presbyterian Church, Rochester, NY and a member of the NEXT Church Advisory Team. In this delightful talk, Joe Clifford explains the chemistry concept of the “adjacent possible”– there are numerous chemical reactions possible based on what is next to you. Likewise in the church, Joe notes, there is extraordinary change and opportunity possible, limited only by what we’re adjacent to. He cites as an example the possibility of connecting the Young Adult Volunteer program to campus ministry. The introduction is by Agnes Norfleet. Joe Clifford is the pastor of First Presbyterian Church of Dallas, TX and member of the NEXT Church Advisory Team. Agnes Norfleet is the pastor of Shandon Presbyterian Church in Columbia, SC and member of the NEXT Church Advisory Team. In this honest, funny sermon, Shannon Johnson Kershner reflects on the gift of being given the powerful message of God in the imperfect, cracked pots of ourselves and the church. Rather than forcing us to prove ourselves worthy of God’s message, we are free to live it as best we can. Shannon Johnson Kershner is pastor of Black Mountain Presbyterian Church in Black Mountain, NC and Co-Chair of the NEXT Church Strategy Team. [Andrew’s talk begins at: 2:54] “Missional action almost always has evangelical results,” says Andrew Foster Connors in this 20-minute talk on missional leadership, or, as he calls it, “The Pastor as Organizer.” In this inspiring talk, Andrew names five leadership insights he’s gained from community organizing and how they’ve shaped the congregation he serves into more faithful, fruitful followers of Christ. Tim Hart Andersen introduces. Andrew Foster Connors is the pastor of the Brown Memorial Park Avenue Presbyterian Church in Baltimore, MD and serves on the NEXT Strategy Team. Tim Hart Andersen is the pastor of Westminster Presbyterian Church in Minneapolis, MN and serves on the NEXT Advisory Team. [Begins at: 33:56] The church isn’t dying; it’s changing. God isn’t done with the church. At the first NEXT Church National Gathering, Tom Are identifies theological convictions that ground the NEXT Church movement and calls on the church to find its voice to bring good news in an age of anxiety and transition. Tom Are is the pastor of Village Presbyterian Church in Prairie Village Kansas and serves as the Co-Chair of the NEXT Church Strategy Team. [Worship begins at: 47:30; Sermon begins at 58:26] There is much conventional wisdom about why North American Protestant churches are in decline. Scott Black Johnston, reflecting on the prophet Jeremiah, suggests that the church has been sent into exile because we’ve been corrupted by political power. In this powerful sermon, Scott names the gifts of exile and calls us to follow God’s command to the ancient exiles: seek the welfare of the city in which I have placed you in exile. Scott Black Johnston is the pastor of Fifth Avenue Presbyterian Church in New York City, New York and served on the initial steering committee of NEXT Church. At ordination and installation Presbyterian elders promise to serve with energy, intelligence, imagination, and love. Of the four, imagination may be the most challenging. Unlike a body of information or set of procedures, imagination can’t be mastered by the intellect. Imagination must be inspired and sparked. Being open to the imagination and acting on it requires effort and courage. It’s always much easier to go to the default setting: what did we do last year (or last century)? While it might not be possible to train the imagination in the same way we study the contents of the Book of Order, it is possible to give the imagination a workout. One of the primary ways of doing that is telling and listening to stories. That’s why storytelling is central at all our NEXT Church gatherings. We listen once again to God’s story in scripture, and we share stories of what God is up to in the church and in the world now. Healthy small congregations are a rich source of stories to spark the imagination. We offer a great deal of “scope for the imagination,” to the church at large, to use Anne of Green Gables’ expression. Now that the mainline church finds itself pushed to the sidelines, it makes sense to listen to the witness of small congregations that have always lived and served on the margins. We know that it doesn’t always take a program and money and big buildings to answer the call of God. We know—or at least we’re learning—what it means to live simply and sustainably by radical dependence on God. We know how to rise to the challenge of operating creatively within limits. 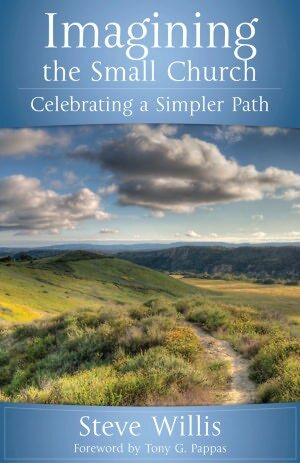 In his new book Imagining the Small Church: Creating a Simpler Path (Alban), PC(USA) pastor Steve Willis shares many sights, sounds and stories from the world of the small church that can bless the imagination of the whole church. He writes, “Imagination is the prayerful interior work that helps me see what is really going on, not so much dreaming things up but rather being open to what could be” (p. 105). The eye of imagination allows him to see God’s upside down wisdom at work in the lives of the people and the congregation. Through imagination he sees both the wonder of what is, and the wonder of what could be. Two other books from Alban that offer imagination-sparking stories from the small church world are In Dying We Are Born by Peter Bush and Born of Water, Born of Spirit, by Sheryl A. Kujawa-Holbrook and Fredrica Harris Thompsett. Bush explores why dying and rising with Christ is the way to new life for every congregation, regardless of size. Writing out of their experience in the Episcopal tradition, Kujawa-Holbrook and Thompsett tell story after story of small congregations finding new life when the whole people of God begin to see themselves as called to ministry. You can find links to reviews of these books on the resource tab of my blog, The Mustard Seed Journal. Note that these books both reflect on what it means to be born again, which is the theme of the NEXT Church national gathering in Charlotte in 2013. Imagination is prayerful work indeed. It is altogether fitting that we also promise to pray when we promise to serve with energy, intelligence, imagination, and love. Come upon us all, Holy Spirit to spark, empower and guide in all these essentials, so that it may be with us as it was on the Day of Pentecost: “In the last days, God says, that I will pour out my Spirit on all people. Your sons and your daughters will prophesy, Your young will see visions, Your elders will dream dreams” Acts 2:17 (CEV). Mary Harris Todd has been a Presbyterian all her life. She grew up in one small congregation, Kirk O’Cliff Presbyterian Church near Mineral, Virginia, and since 1990 she has served as the pastor of another, Morton Presbyterian Church in Rocky Mount, North Carolina. She is amazed at the God whose foolishness is wise, and whose power is made perfect in weakness. Visit with her online at The Mustard Seed Journal, where you can find lots of resources for small church ministry. Our church is one of the few congregations in our city that still offers a weekday morning Vacation Bible School. It is a lot of work to make the week come together, but the children and volunteers love it. Early in 2012, I set to work preparing a curriculum that would fit our goals for Christian education. After much brainstorming, my key volunteers and I settled on the theme “Come to the Table: A Journey from the First Passover Meal to the Last Supper.” Our goal was to teach children about the Eucharist, and to connect the story of God’s people in Exodus to the Sabbath meal Jesus shared with his disciples on Good Friday. For weeks, we tossed around ideas of creative ways to help the children express what they would be learning each day. My creative and enthusiastic co-director Kathy knew just where to turn for inspiration. The image of our week would be the communion table. With only an old donated kitchen table, we turned to a church member with the skills and vision to create a beautiful piece of worship art. As this man planned and measured and ordered thousands of tiny colorful tiles, I hoped the piece would come together as he dreamed it would. Many times throughout last spring, I thought to myself that an ordinary person would not have the patience for such a venture. This man was not daunted. His plan: to have 100 children create a mosaic of the Last Supper over the top of a worn out kitchen table. This one member enlisted the help of a woodcutter and a portrait artist in our church. He fortified the table to withhold the weight, another member enlarged a children’s coloring book page to be our pattern, and others set about sanding and painting. At last, the prep work was complete. It was time to turn the table over to our children. Over four mornings in July, the children of our church and neighborhood created a communion table that will host a sacrament for generations. Each day, I photographed the progress. Little fingers, many little fingers, pieced together the Last Supper. We were all fascinated to see the scene come to life. Each day, volunteers took time to allow our children to choose their tiles, to slowly squeeze out glue, and to fit their colors into place. They were so careful with their work. The stage of our Fellowship Hall, where the children worked, was quiet with reverence, as they meditated on piecing together this holy scene. Reflecting back on this VBS project, I often consider how much easier it would have been for the adults to do the work themselves. It took far more time to plan, to prepare, and to wait for younger, unskilled hands to complete the table. It is the work of these little fingers in partnership with our artists and volunteers, however, which gives the table its deep meaning in our church family. I think about this often. Like many of you, I feel the frustration of recruiting many hands to staff programs and mission. Some days, it is a struggle to find those bodies that can make an event or a worship service come together. From time to time, I find myself doing the work a volunteer should be doing. I tell myself it would be simpler for me to accomplish the task myself rather than find, call, and train a volunteer. If I’m not careful, however, it is easy to forget how much more worthwhile it is to share that load and enlist the participation of others. My ministry is to equip these people, not do the work of the church alone. I remember those adults who patiently waited for children to work and to find just the right tile that was the perfect shade and shape. My job is to do just that. My job is to wait, pray, and patiently discern ways to equip God’s people to share in the ministry of Christ’s church. My job is to equip them and to walk beside them, seeking out ways that their gifts might meet a need, fitting just the right tile into just the right space. Elizabeth Howell is the Associate Pastor of Christian Education at Second Presbyterian Church in Roanoke, VA, where she coordinates Sunday and mid-week educational opportunities for children and adults. She loves worshiping with her congregation, ordering fresh packs of curriculum, and taking long walks with a hardhat (her church is in the midst of an 18 month renovation!). In her free time, Elizabeth enjoys spending time outdoors with her fiancé Chris and their dogs Penny and Berk. During this week we are reminded of the many things for which we are thankful. When it comes to the church, even though I am passionate about moving us forward into God’s future for us, I am also deeply grateful for the gifts we have inherited from our predecessors in faith. Whatever it is that we may contribute to the emergence of God’s kingdom in the world today, it will rest on the foundations of the past. Even when we can recognize cracks in those foundations, we wouldn’t be where we are today without the faithful work of our spiritual mothers and fathers. I once heard Richard Mouw describe mainline churches as repositories of historic tradition that are necessary elements in the dialectic work of reimagining what church can be. Phyllis Tickle has famously described historic transitions in church and culture as “rummage sales” in which we sort out what it is from the past that we need to hold on to and what we can jettison. These tasks are critical for us as we imagine what is “next” in God’s vision for us. It seems to me that if mainline Protestantism has a particular charism in the far-reaching revolutions taking place in Christianity today, it will involve the discerning work of recognizing the gifts of our inherited tradition and how it is that God is calling us to adapt these resources and develop new ones as we seek to faithfully respond to the rapidly changing contexts of ministry in today’s world. Some have called those who attempt such work “loyal radicals,” a label I wish more of us would embrace. Last week my congregation, Fourth Presbyterian Church, dedicated a major building expansion. The Gratz Center is a thoroughly contemporary building that reflects the bold architectural styles of Chicago. The building committee and architects knew that there was no way we could build something new to match our iconic gothic sanctuary and original structures from a hundred years ago. Our new church campus therefore reflects two critical postures: our embrace of the past and our commitment to the present and the future. When it comes to ministry in my local context, I hope that our congregation can live up to this exegetical interpretation of the buildings we inhabit. My hope is the same for the PC(USA) as a whole. I pray that we might find a way to gratefully embrace where we’ve been yet boldly follow Christ into God’s future. John Vest is the Associate Pastor for Youth Ministry at Fourth Presbyterian Church in Chicago. He blogs at johnvest.com<http://johnvest.com> and is working on a DMin at McCormick Theological Seminary. He dreams of one day achieving the mystical union of church and BBQ.